You can say this — Score-Board — just like at the ball game! 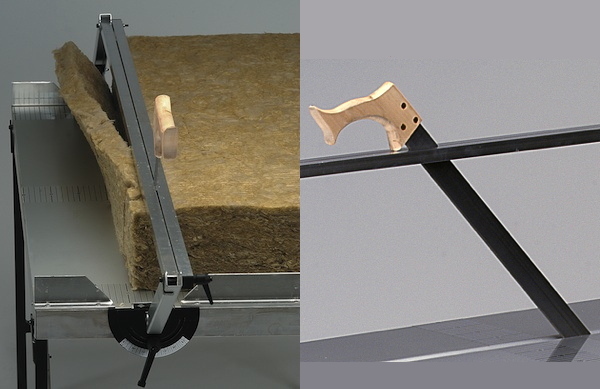 The SkärBord Insulation Cutting Table is a tool widely used in Scandinavian factories and construction sites. It is used to cut insulation accurately and quickly to to make it easier to do a high quality installation. Many of our readers were curious about this tool and many wanted to buy one. Now finally it is available in the United States and Canada, and builders and factories here can take advantage of this time saving tool. The SkärBord is simply the best tool for cutting insulation, and the only tool you need if you are indeed serious about good insulation installs. 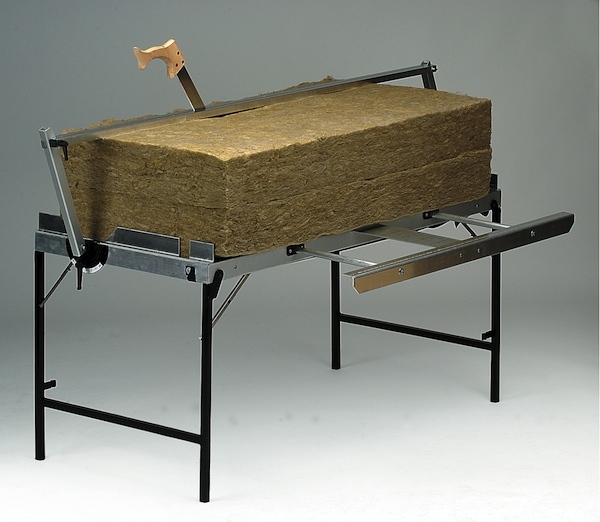 There is no faster, more accurate, or easier way to install mineral wool insulation and interior sound batts. And the SkärBord is effective for cutting a range of other insulation types as well: fiberglass, foam, and wood fiber insulation panels all benefit from the speed and accuracy that comes from working with the SkärBord. Sweden has long been the home of high performance houses, and the SkärBord was developed there by demanding contractors who wanted to work fast and accurately. The SkärBord keeps your work at the proper height and allows you to quickly gauge and slice insulation batts using the included stone wool knife. The table sets up and folds flat in seconds and can be easily moved near the work so there is less walking. Ruler marks on the Skärbord top allow you to put away your tape. Just set the batt to the mark and slice. Perfect cut every time. And Skärbord holds the knife in the cutting position so you don’t need to bend over to find it. You will never crawl around on the deck with a razor and 2×4 again. In concept the SkärBord is like a carpenter’s miter box. It makes it easy to make straight cuts, angled cuts, and multiple cuts to to the same size. 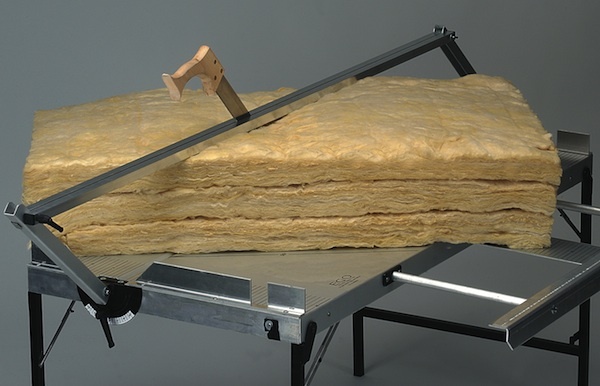 The tall gate accepts multiple layers of insulation so you can cut several pieces at the same time, to the same exact size. So why is an accurate cut important to a good installation? 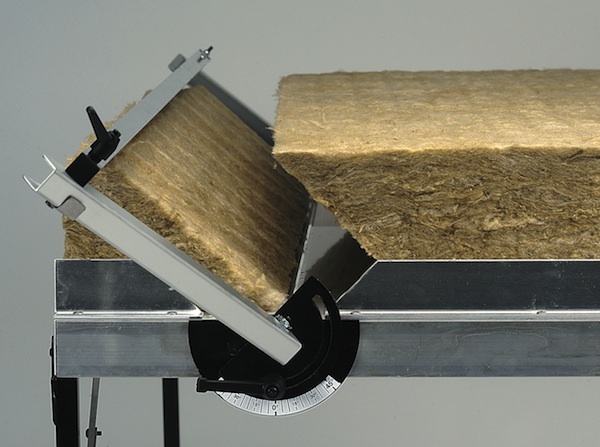 Accurate cutting and fitting of insulation can make the difference between a warm wall and one full of cold spots. Improperly fit insulation allows convection loops to form in the gaps, which will allow heat to bypass your insulation. It can be like leaving the window open in winter. The solution to this is a quality install job where the batts are cut accurately and fit the wood framing snugly. You don’t want your insulation stuffed into a space, nor loose with gaps. SkärBord makes an accurate fit fast and easy. Its the best tool for quality installations. ByggHouse is assisting Ego-industri AB in bringing in the SkärBord table to the North American market. The new version marked in inches is available now directly from ByggHouse for a limited time until wider distribution begins. Fitting insulation to odd sized stud bays is something you do on every job. SkärBord lets you cut two 4ft pieces at one pass, to the exact same size. Both will fit perfectly, saving you time and giving you a top quality installation. Cutting insulation to the angle of a gable end wall is something else you do on every job. Again SkärBord lets you cut two pieces at one pass, to the exact same angle. Now you have 4 pieces that will fit perfectly. More time in the bank and mastery over another quality stumbling block. Where your insulation meets the ridge you’ll want to fit the insulation into that triangle to prevent forming a void. Admit it – if you’ve been working with fiberglass you never bothered to do this right. SkärBord lets you do this the way you know you should. Perfect fit, no voids, and no time wasted. And any place where you need small or narrow pieces to make that install as good as it can be, SkärBord makes those cuts fast and easy. Now you’ll find doing the best quality insulation install possible is faster than the sloppy work you settled on before. The right tool makes all the difference. Are you ready to step up your game, and save time doing it?